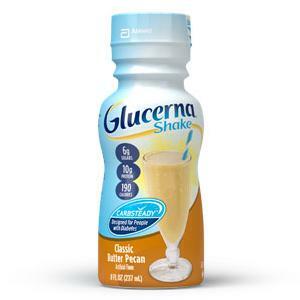 Glucerna® Shake Ready-to-Drink Homemade Vanilla with Carb Steady® 237mL Bottle, Gluten-free - Bi Medical Distributors Inc.
Glucerna® Shake has Carb Steady®, unique blends of carbohydrates, to help minimize blood sugar spikes. Minimizing blood sugar spikes over time can help lower A1C. For people with diabetes. For use as a supplement, snack, or meal as part of a diabetes management plan. • Glucerna products are for use under medical supervision as part of a diabetes management plan. • Specially formulated to help meet ADA Nutrition Recommendations and lower A1C levels. • Clinically shown to help people with diabetes lose weight when used as part of a structured weight-loss program. 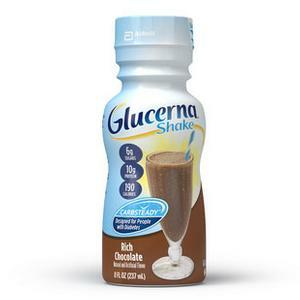 • Glucerna Shakes have been the #1 doctor- and nutritionist-recommended liquid nutritional product for people with diabetes. • 27 vitamins and minerals for Complete, Balanced Nutrition®. • Uniquely designed carbohydrate blend clinically shown to help reduce postprandial glucose response.